The world is a weird and wonderful place and it seems there is no shortage of knowledge as to how it works. While kids may toil in their science classes learning about the biology things and the chemistry stuff (science was not my strong subject), sometimes it’s fun to spice up the learning process by throwing in some WTF science facts that my blow their minds – or, if they are octopuses, all 9 of them. Butterflies drink turtles’ tears when they need salt. This does not apply to all butterflies – specifically those in the Peruvian rain forest where the Andes mountains prevent sodium from the Pacific Ocean to be carried over in the rain. This causes the butterflies, and other plant-eaters, to crave salt and seek it wherever they can. Researchers have even caught parrots licking salt off of rocks. Therefore, it is quite smart of these butterflies to seek salt in turtle tears. Next question: Why do Peruvian turtles cry? Sloths can swim 4 times faster than they can move on land. Yeah, we all know that scene from Zootopia. And, yeah, it still makes me snort-laugh every time. 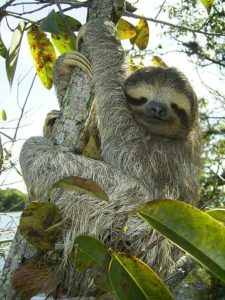 Sloths are notoriously slow creatures. In fact, they are the slowest land mammal in the world! They move so slowly to conserve their energy since their plant-based diet does not provide much of it. They also spend 90% of their lives hanging upside down and trees and usually only come down to the ground to poop. It is safe to eat the stickers off of fruit. But it is not recommended, even though the glue used to adhere the edible paper is FDA approved. It is suggested to remove the stickers and wash the fruit before consuming. The sticker itself contains a 4-5 digit code known as a PLU or Price-Look Up. These are used to make check-out and inventory easier as well as to indicate attributes such as variety, how it’s grown and size. The PLU for bananas is 4011. You’re welcome. No two wolves howl on the same note when howling together. When howling, wolves harmonize in order to create the illusion that there are more of them. Wolves use howling as a means of communication, whether it be to defend territory, rally the pack or respond to other nearby wolves. 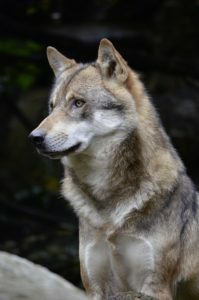 Despite popular belief, wolves do not only howl at nighttime. In fact, they mostly howl around sunrise and sunset. Also, they do not howl from sadness. That is just humans making things more tragic than they need to be. Under the beautiful orange and black fur are matching stripes on the tiger’s skin and the pattern of striping is as unique as a fingerprint. The stripes themselves serve as camouflage for tigers by breaking up the outlines of their bodies, making them hard to see. To prey, the stripes give the illusion of shadows as tigers wait among tall grass and trees where they generally hunt. Speaking of orange and black stripes, tigers come in other colour varieties as well such as white with black stripes and golden with cinnamon stripes. Octopuses (or octopodes) have 3 hearts. One heart is used to circulate the blood (which is blue, by the way) and the other two are used to pump the blood to their gills. 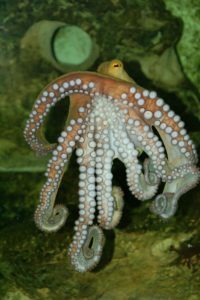 Octopuses also have 9 brains! One is a main brain while the other 8 reside in each tentacle to control movement.